Abigail Wendover is the youngest sister of a formidable clan, "on-the-shelf" and headed to spinsterhood at the ripe old age of 28. She and her much older sister Selina are in charge of raising their headstrong niece Fanny. Abigail has just returned to Bath from a visit to London and discovers that Fanny has taken up with ne'er-do-well rogue Stacy Calverleigh (who is after her fortune), although Fanny is in the throes of love and can't see Stacy's faults. Chance happens to bring Stacy's uncle Miles Calverleigh to Bath, after having been exiled to India for 20 years. Miles's blunt manner should shock Abby, but instead she finds herself laughing at his disregard for society and family duty. At first he is unwilling to have anything to do with his wayward nephew and refuses to intervene for Abby's sake, but his regard for her soon has him rethinking his stance. 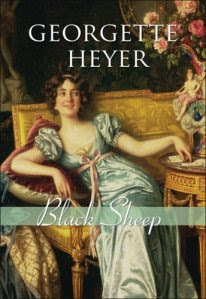 This is a delightful book, my favourite so far of all the Heyer books I've read. (Yes, I liked it better even than The Grand Sophy, whose heroine is a little bit too unconventional for my taste). Heyer is a genius at creating three-dimensional characters, so that even the hysterical older sister is shown to be sympathetic when she sides with Abby against their tyrannical older brother. Abby is one of the most delightful heroines I've ever encountered, right up there with Elizabeth Bennet. She is fashionable and pretty but not overly gorgeous, she has a wicked sense of humour and she doesn't take herself seriously. The real conflict of the novel here is internal, with Abby warring against a sense of duty to her family and desire to do something for herself and marry the man she loves. This is one of the few novels where I think I actually liked the heroine better than the hero. Although several reviews I read complain about the ending, I thought it was perfect, and a perfect way for Miles to force Abby to overcome her scruples. As always, the dialogue is excellent, making me grin throughout my reading of the novel. I love how the repartee represented the way both the hero and heroine have had to develop their personalities, given that neither are the best-looking people in town. I found myself eagerly looking forward to when I would be able to fit in a few more chapters, a sure sign of an excellent book. A real summer treat.